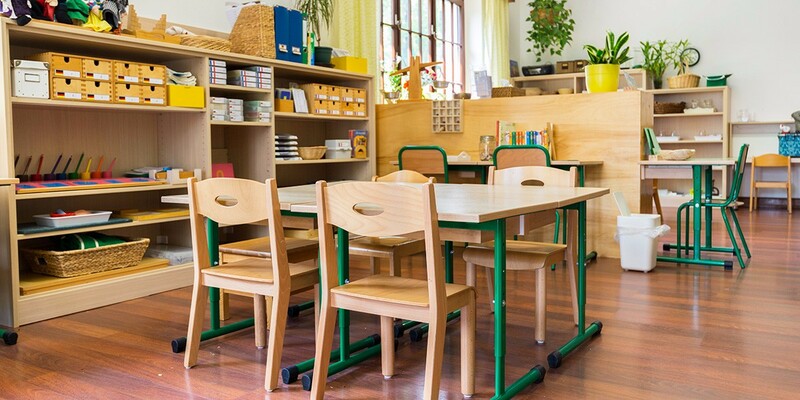 The term “atmosphere” was dedicated by Maria Montessori both to the living areas in which children develop and to the mindset by which they are surrounded. The atmosphere plays an important role in the development of children as it responds to a number of different sensitive periods. The teacher is responsible for setting the atmosphere and making it pleasant and attractive, ordered and arranged, serene and calm. Our different classes therefore meet these criteria: they are harmonious (each class has its own colour) and organised into areas. We think that it is important for them to continue to respect the criteria specified by Maria Montessori. They should represent learning units in which there is no competition but equal opportunities for all. We are a bilingual school and practice French and German. 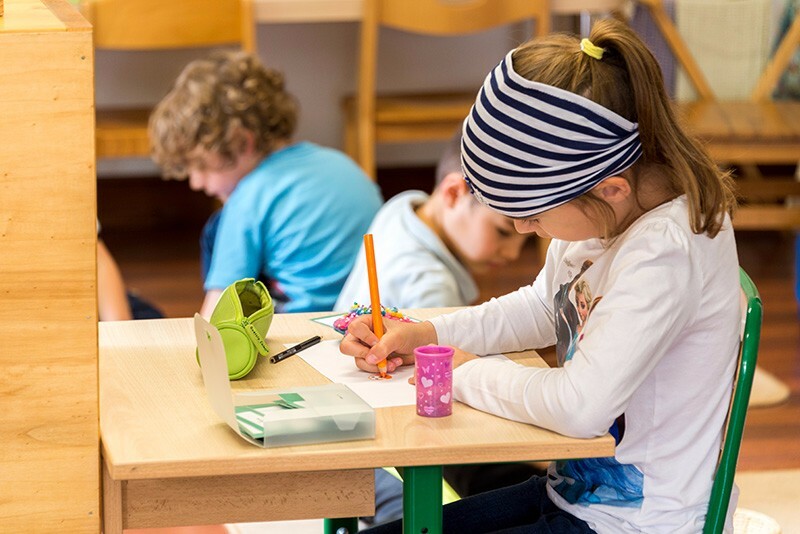 We are eager not to establish obligatory language classes which pupils would have to attend according to set durations and frequencies: We would rather plunge the children into a non-aggressive and continuous “language immersion”. Each language is spoken by a native-speaking teacher so that pupils are able to correctly pick up the accent and learn the syntax. 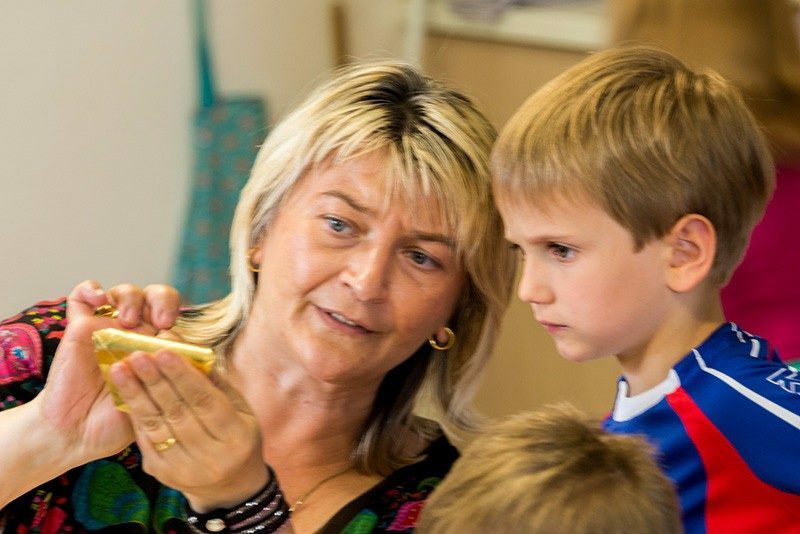 We have established material tailored to the characteristics of each language to enable children to broaden their knowledge. Practical life exercises enable the children to acquire their autonomy by their direct relationship with daily life. Tying their shoelaces, getting themselves something to drink or eat, putting on their coats, cooking or washing up, sweeping the floor, dusting, looking after plants and animals…are just some of the activities on offer to the children throughout the day. The emphasis placed on politeness and courtesy completes the children’s integration into daily and social life. 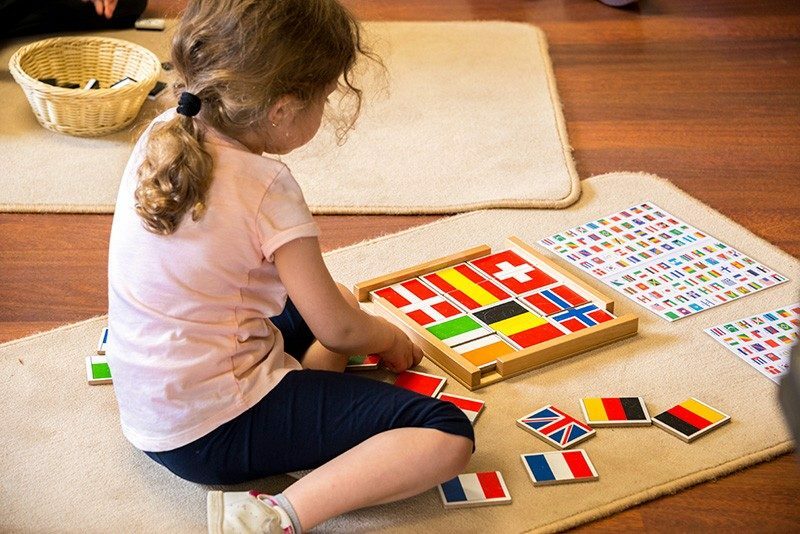 It is of the sentence « There is nothing we understand that we have not previously felt », from Aristote, which Maria Montessori based her idea to create and develop her sensorial materials. This is a matter of addressing the great geometric and mathematical notions by tangible means. Children are attracted by mathematical accuracy and truths, and there is a particular scientific nature in that. Maria Montessori therefore created mathematical material to meet the expectations of children. 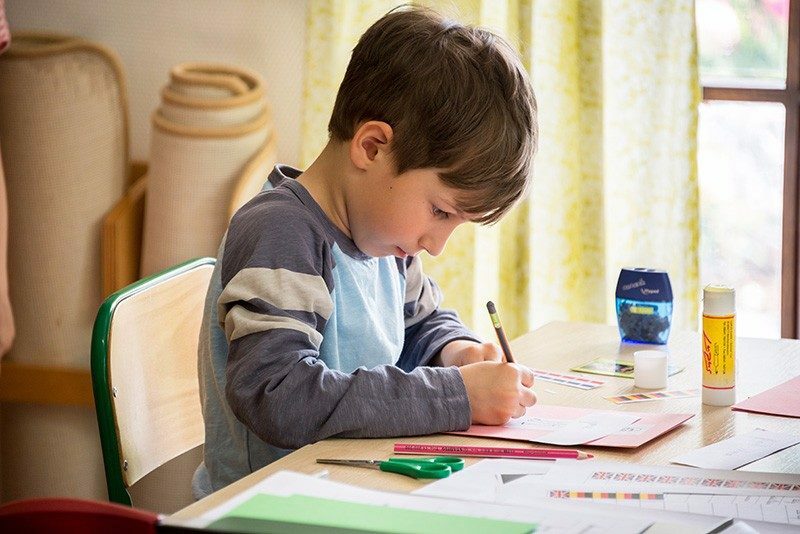 The association of a mass and a symbol, the notion of 0 or even/odd and the decimal system and mathematical activities can therefore be grasped by children. The freedom of knowing how to read and write is particularly attractive to children. That is why we favour learning processes in this regard at our school. 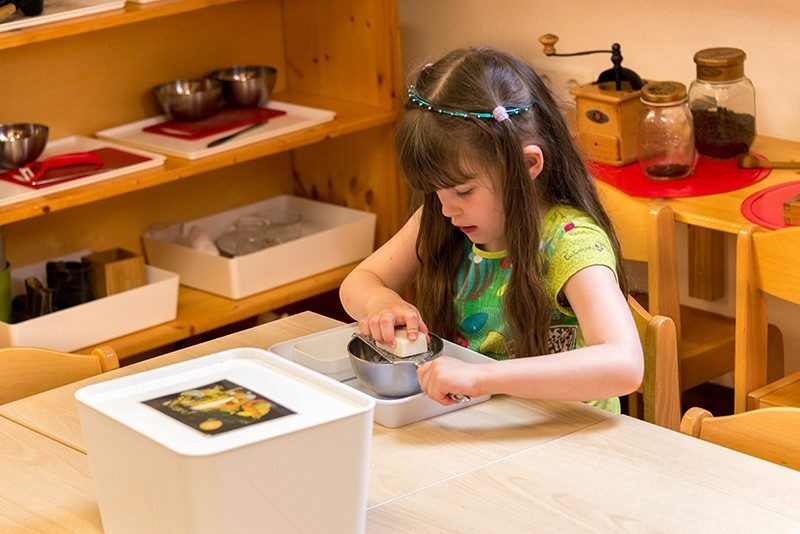 Maria Montessori created adapted language material which meets, but does not upset, their expectations: sandpaper letters or mobile alphabet mean that children can learn how to read and write in an elementary way. Children are naturally open to the world they live in: nature, the past and the cosmos. 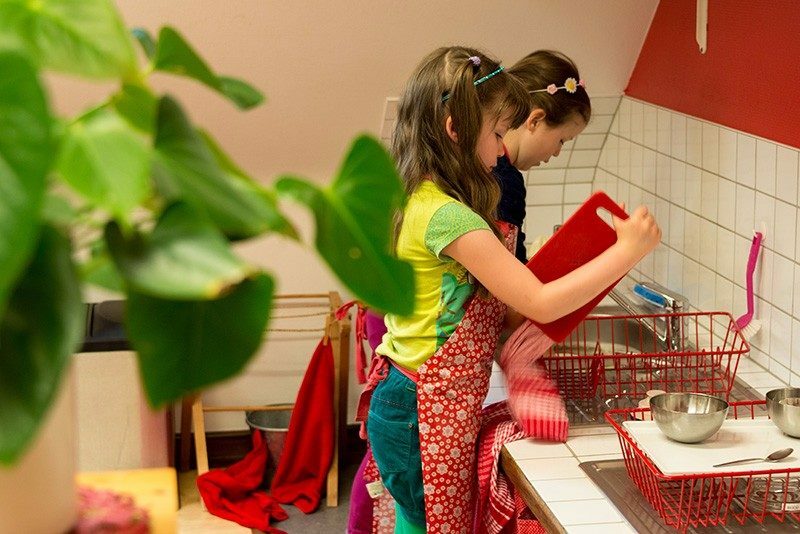 It is therefore important to allow them to live their own experiences and make their own discoveries: looking after the vegetable garden, strolls in the forest, educational trips to farms or the zoo…these all enable the children to discover their environment, its structure and the way it works.